This is a NFC card. NFC stands for Not Factory Cut. The cards are hand cut into the shape and size of a normal MTG card from an Uncut sheet of cards. Uncut sheets are given away as prizes for various Magic events or have been obtained by people from various inside sources. These cards are intentionally cut as miscuts so that the person cutting the sheet can sell the individual cards at a premium. These cards are used as a form of pimp, but they ARE NOT MISPRINTS. Manufacturing and selling NFC's has become a fairly profitable business. As a result, the techniques and equipment used to cut the sheets has moved into the professional grade stuff, which makes the cards physically indistinguishable from WotC factory cut cards. Fear not, because there are a few way to identify these chopped cards. One of the easiest ways to identify NFC is to simply know which sheets have been cut. If you regularly check eBay or are part of the "NFC Lovers and Non-Magic Snob" Facebook group, you'll be up to date on what's out there. For the rest of you, I've taken the time to compile a list of everything that I've seen, which you can find below (just scroll a bit). The next easiest way to identify NFC, is to understand what can't be (or most likely isn't) NFC. We know that the primary source for new NFC's are prize support from various events. Thus we can rule out any current product that isn't offered as prizes. This includes Commander Decks, Non-Foil Sheets from current sets, Duel Decks, and Promos. There are a few types of factory miscuts that NFC choppers don't attempt to replicate. These are the miscuts that get really screwed up and don't have the same shape as a standard tournament legal magic card. Usually these cards have two different types of diagonally symmetric corners. See the examples below. It's also worth mentioning a specific type of misprint that resembles a miscut, but is guaranteed to not be NFC. These are the cards where one side is miscut, and the opposite side is perfectly aligned. Another means to identify some NFC cards comes from how some sheets are stored. Not everyone has the space to store uncut sheets flat, and a lot of sheets get rolled and placed into tubes. Some NFCs don't get properly flattened and end up keeping some of the curve from their previous existence of a rolled up sheet. The longer a sheet is stored rolled, the more difficult it is to flatten. This holds true once the NFC has been chopped into card form. Notice how all of these NFCs are curved. The top and bottom of each card isn't even resting on the flat surface. Image courtesy of Eli Kassis. Your last bit of defense against unknowingly purchasing NFC's is your common sense. There's no formula for this one. If something feels wrong, or it's a pretty severe miscut on a very playable card, take the time to do a bit of research before you go through with it. Look at eBay sold listings to see if it was recently sold. READ the descriptions in eBay auctions if you're buying it off of there. Some NFC sellers will use the word "Alter" to describe the card. Sometimes the seller doesn't know that their card is NFC though. Ask around for a 2nd opinion. Be vigilant! Know what you're buying. Some people love NFCs. Others hate them. Now that we understand a little more about NFCs I thought it'd be interesting to discuss their impact on the MTG community and the sub community of misprint and rarities collectors. First, lets take a quick look at why people collect misprints. There are several categories of misprint collectors. You have collectors like myself who love any and all types of misprints and aim to collect examples of each type. You have collectors of specific cards or types/genres of cards who want to add misprinted versions to their collections. And finally, you have the largest group (based on no statistical evidence whatsoever) of collectors, the folks who want to add a different kind of pimp to their MTG decks. Collectors can also be any combination of the aforementioned categories too! Why bring up the different types of collectors you ask? It's because NFC's impact each of these groups slightly differently. For the first group of collectors, we generally tend to have very mixed feelings on NFCs. Overall, I'm fairly indifferent to NFC's. Personally I don't collect them, but I can understand those that do. On the other hand, it breaks my heart to see sheets with super rare cards (like the Urza's Destiny sheets) get cut to mimic the legitimate versions of the super rare cards out there. The 2nd group is a little different. They've got tunnel vision and on the other end of that tunnel is a Grizzly Bear. Any and all forms of Grizzly Bear are desirable, and the NFC's are another checkbox on their list of Grizzly Bears to collect. They will in all likelihood never touch another NFC, but hey, check out this awesome 2/2 for 2! The 3rd group is where the greatest divide lies. To a lot of these collector/deck builders card legitimacy is an all or nothing matter. 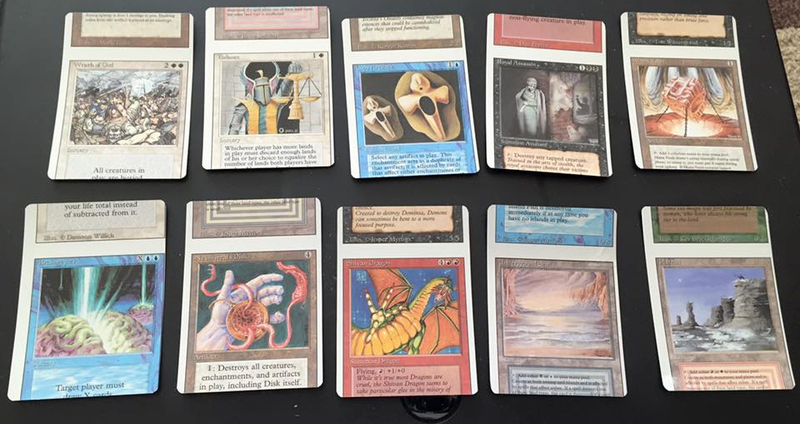 When it comes to the eternal formats, sometimes the only way to get pimp versions of the playable cards (without spending a small fortune) is to go NFC. They're acceptable. There are also plenty of pimp deck builders who look down on NFC's as a lesser form of pimp due to the accessibility and/or legitimacy. What's the most important about this group is that this is where the majority of the demand for NFC's lives. Without this group NFC's probably wouldn't be as popular as they are, and thus a less viable business option for sheet choppers. One thing that all groups can't avoid, is the impact of NFC's on the misprint market. While an increased size of MTG print runs results in an increased number of misprints getting into the community's hands is one of the major factors in tanking the miscut market, NFCs are arguably an equal part if not the main reason. Buyers and sellers are now in a state where the legitimacy of any miscut is in question. This is not healthy for the misprint community, and my main motivator for writing this article. Like it or not, Magic is a profitable business for many people. As long as there is magic, there will be people who will take advantage of the financial opportunities it provides. As collectors this is a cold hard fact we must come to accept.